Bill Vernon, “Part-Time Professionals: The Seldom Scene,” Muleskinner News, March, 1973. If the Country Gentlemen are to be credited with popularizing bluegrass to college and northern audiences, Tom Gray was arguably their first and most passionate convert. While in high school (’58) and a university undergraduate in Washington, D.C., Gray was a regular at the Gentlemen’s gigs and occasionally sat in. When the bass chair opened in September of 1960, he was invited to fill it and did so for four years, at the same time finishing his studies and starting work as a cartographer for the National Geographic Society. Born in Chicago, Gray moved to Washington, D.C. at the age of seven, when his father took a job with a trade association in 1948. There he was exposed by a babysitter to the sounds of the Grand Ole Opry, before country music was considered respectable in educated circles. At 12, he started playing guitar and then the mandolin. Attracted to the lowest notes in music, he began playing what eventually became his primary instrument when Tom Morgan left a string bass in Gray’s basement after a jam session. His primary role models were the inordinately flashy Shuffler Brothers, George and John, of Valdese. North Carolina, who began playing bass on Stanley Brothers Columbia and Mercury 78s in 1952. Tom ardently collected these discs, and the older mountain music that preceded them. He was also influenced by Keeter Betts, a jazz bassist who played with guitarist Charlie Byrd. As a student at Western High School and George Washington University, Tom Gray found kindred musical spirits at the dawn of the folk music craze. The Rocky Ridge Ramblers included Monte Monteith on guitar, Jerry Stuart on mandolin, Bob Lindter on banjo, and Ron Roswell on fiddle. Stuart and Gray (playing guitar) joined Pete Kuykendall and Smiley Hobbs on Stuart’s mandolin instrumental “Rocky Run” for the 1959 Folkways album Mountain Music Bluegrass Style, produced by Mike Seeger. The Country Gentlemen welcomed innovation and virtuosity. When he joined that group, Gray was encouraged to play flashy walking 4/4 bass lines and to solo. John Duffey instructed engineer Pete Kuykendall to raise Tom Gray’s levels for their Folkways recordings, as Starday had used such inferior vinyl that the bass was virtually inaudible. Paradoxically, Tom Gray, who had the least rural background of any member, was the most devoted to tradition and the least comfortable with stylistic accommodations to the folk audience. 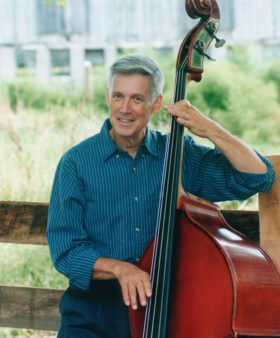 A florid bassist, his vocals – most often duets with John Duffey or on gospel quartets – were decorous and thoroughly within the bluegrass tradition. Surrounded by the constant stage antics and outbursts of John Duffey, Eddie Adcock, and Charlie Waller, Tom Gray was the dapper and unflappable straight man. In September, 1961, the Country Gentlemen appeared on a multi-artist bill at New York City’s Carnegie Hall, sponsored by Sing Out magazine. It appears that the concert was recorded and six tracks were subsequently released in a reissue of the Folkways live album, On the Road. Starday released an album of studio recordings titled The Country Gentlemen at Carnegie Hall featuring Tom Gray on bass. Folk Session Inside was a nationally distributed Mercury album, released in 1963. It was well received and helped the group to increase its booking rates and radius. A second Mercury album was recorded and network television appearances were under discussion in 1964 but, when label personnel and the folk music market changed, the industry didn’t seem to know what to do with the Country Gentlemen – and so it did nothing. By this time, Tom had married Sally Govers Gray, and begun to father a growing family. His career was musically rewarding but the unpredictability, scarce financial rewards, and constant traveling were aggravating even to a man in his early twenties. In July, 1964, Tom Gray left the Country Gentlemen and was replaced by Ed Ferris. For the next two decades he compiled and edited maps for the National Geographic Society. Several times a week, he would play bass in the Washington area with acts such as Benny & Vallie Cain, Red Allen, Buzz Busby, Leon Morris, Bill Emerson & Cliff Waldron, the Stanley Brothers, Jim & Jesse, Bill Monroe, and the New Sunshine Jazz Band. When Tom Gray and John Duffey got together with John Starling, Ben Eldridge, and Mike Auldridge in 1969, it was for a basement jam session at Eldridge’s house in Bethesda, Maryland. Their first public performance was at a Georgetown rock club in late 1971. All had day jobs, so the group named itself the Seldom Scene. Their weekly gig at Bethesda’s Red Fox Inn (moving to the Birchmere in Alexandria, Virginia, after five years) continued to be packed, and the demand for concert, festival, and recording appearances was irresistible. Through John Duffey’s death in 1996, the act was consistently in the top ranks of the bluegrass world, winning numerous group, individual artist, song, and album awards. As had the Country Gentlemen in an earlier era, the Seldom Scene supercharged bluegrass, adding elements of country, folk, and rock, in the context of a spontaneous and entertaining stage show. At the end of 1974, the Seldom Scene released a double live album. It was an audacious venture in bluegrass at the time, but became a classic, and has since been reissued twice on CD. It features Tom Gray’s bass solo tour de force, “Grandfather’s Clock.” Tom also performed on the group’s 15th and 20th anniversary live albums, the latter as a returning alumnus four years after leaving the group. Bluegrass music cooled off a bit in the ‘80s. Anxious to broaden their appeal and attract new markets, members of the Seldom Scene consciously sought to modernize its sound. This didn’t go over well with Tom Gray, once again the most traditionally oriented member of his band. “To avoid becoming an obstacle to progress” (in his own words), Tom left in October of 1987, replaced by T. Michael Coleman on electric bass. Retiring from full-time band work for the second time, Tom Gray hardly let his instrument gather dust. He was in demand for recording sessions, performed on Country Gentlemen and Seldom Scene reunion projects, and accompanied old friend Bill Clifton on four international tours. Especially as he began to wind down his career as a cartographer, Gray found himself saying “yes” to more and more part-time band work. Most were bluegrass and folk oriented, but Tom also enjoyed a regular Dixieland gig with a group called the Federal Jazz Commission. The youngest member of bluegrass music’s pioneers, Tom Gray continues to be a welcome and familiar presence onstage. A member of the “classic” edition of the Country Gentlemen, one of the first bands to introduce bluegrass to urban and college audiences, and a founding member of the Seldom Scene, perhaps the most influential bluegrass act of the ‘70s and ’80s. Voted best bluegrass bass player eight times while a member of the Seldom Scene. 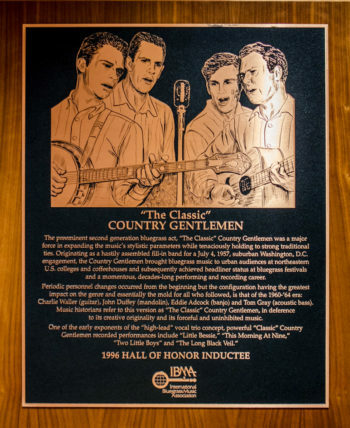 Bluegrass Hall of Fame, 1996 — the first bassist to be inducted. Played accordion and piano before discovering the bluegrass sound in the early ‘50s. Currently plays in seven Washington-based bands in several genres, and occasionally edits maps for the National Geographic Society’s Book Division. Tom’s wife Sally edited Bluegrass Unlimited magazine in the late 1960s. Quoted by Jon Hartley Fox in liner notes to The Country Gentlemen: Going Back to the Blue Ridge Mountains, Smithsonian Folkways Records, 2007. Quoted in Gary B. Reid’s liner notes to The Country Gentlemen: High Lonesome, Starday Records, 1998. Interview with Barry Willis, quoted in America’s Music: Bluegrass, 1989.